Happy New Year! My family always had some traditional black-eyed peas, collard greens and cornbread on New Years’ Day for good luck! Smelling any kind of southern (black-eyed, crowder or cream) pea cooking takes me back to my grandma’s Florida kitchen. She would have a big pot of “peas” simmering with onions, garlic and a little smoked pork. Our New Years meal was always rounded out with fresh ground cornbread or muffins and baked sweet potatoes. Everything except the garlic was grown in our backyard garden and then either put up for later use or fresh cut like the collard greens. Every year since I started growing my own garden, I include these easy-to-grow southern staples in my garden plans, and you can, too. Many people trace the tradition of eating black-eyed peas for luck on New Year’s Day to Sherman’s destructive march through the South. 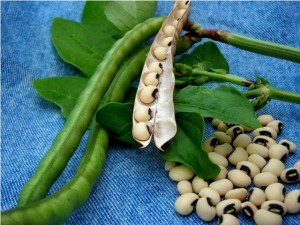 These peas were formerly considered only fit for animal fodder, and so they were spared and then they sustained both black and white southerners through the hard months that followed. That may be a reason the tradition spread — but a Jewish friend of mine says the tradition of eating black-eyed peas for luck on New Year’s goes much further back to the Talmud. According to her relatives, whose Sephardic Jewish ancestors settled around Savannah, Georgia in the early 1800s, the practice was already common long before the Civil War. Whether you know them as southern peas, cowpeas, field peas or black-eyed peas, they are delicious and easy to grow wherever there are 60-90 days of warm weather both day and night. Vining varieties like Big Red Ripper are extremely drought tolerant but need more room to spread out. The ability of southern peas to grow in poor soil is so good that some varieties like Iron and Clay are best known as a soil building cover crop. 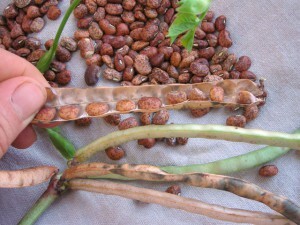 Early varieties like Queen Anne Blackeye Pea can be grown in more northern states. Greens are the traditional companion dish to southern peas. 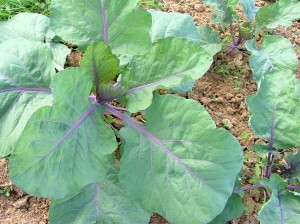 My grandmother loved collard greens, the old timey varieties that turned blue-purple in the winter when the leaves are sweetest. We also sometimes had Southern Giant mustards or Seven Top turnips or just mixed greens from the large patch she would sow in late summer or early fall as the summer heat began to ease. This year Southern Exposure is are offering an old timey variety called Alabama Blue that looks and tastes a lot like the greens I enjoyed as a child. 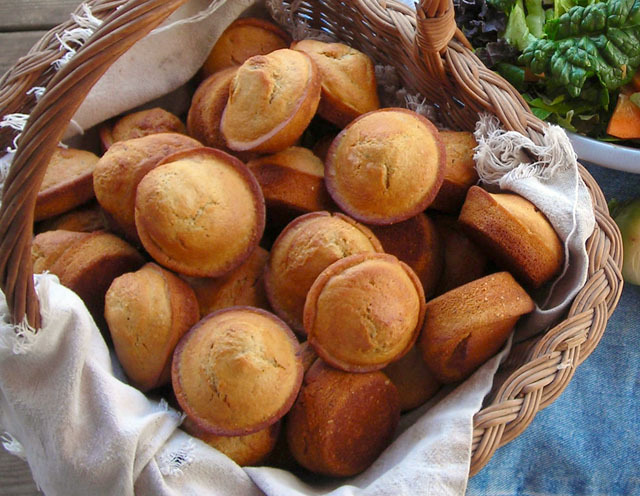 The corn bread we had in my youth was always either yellow or white and baked in a cast iron skillet so it was crusty on the outside and tender on the inside slathered with fresh butter. 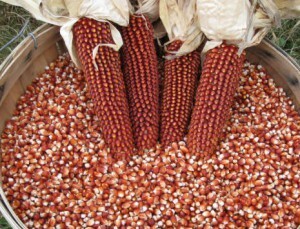 Here at Southern Exposure we not only offer yellow varieties like Leaming dent or Reid’s yellow dent and white like Texas Gourseed corn but also beautiful red corns like Floriani Red Flint and Bloody Butcher. We even offer varieties with blue or mixed colored kernels for an amazing array of colors and flavors. Aside from our website, another good source of information on all these crops and how to grow them is my book The Timber Press Guide to Vegetable Gardening in the Southeast.